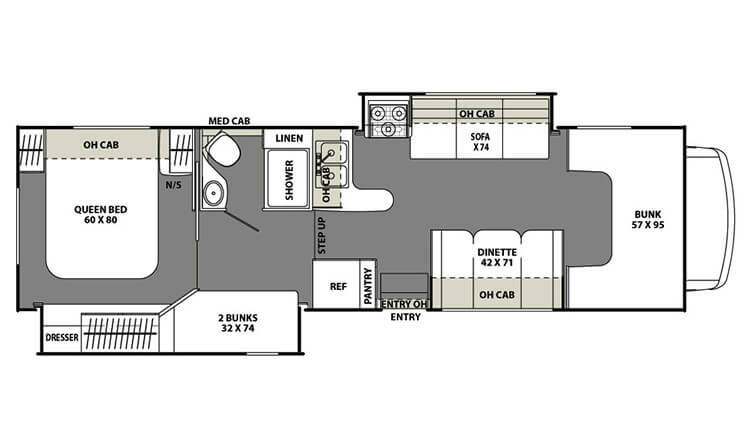 If you're looking for a spacious motorhome with room for family and friends, this is the one. Two slides, a Queen Bedroom, plus one Double and two Twin Bunks! Cooktop (3 burners) with Hood, Microwave, Oven, Refrigerator/Freezer, Double Sink, Peninsula Counter. Sofa(bed) Slide-Out, Dinette, overcab Bunk, lots of storage. Private Queen bedroom with Wardrobes and lots of storage; Slideout with Twin Bunks, overcab Double; Sofabed. Private Bathroom with sink, vanity, enclosed shower, toilet and storage. A/C, Window Blinds, Patio Awning, Exterior Storage, Rear Ladder.